When Renalta Van Markoff, author of the controversial Hudson and Holmes mystery series is murdered at a book signing in the Sherlock Holmes Bookshop and Emporium, the game is afoot and it’s up to the unusually perceptive Gemma Doyle and her confused but ever-loyal friend Jayne Wilson to eliminate the impossible and deduce the truth before the police arrest an innocent man. Gemma is the owner and manager of the Sherlock Holmes Bookshop and Emporium located at 222 Baker Street in West London, Massachusetts (on Cape Cod). Originally from London, England, where she owned a mystery bookshop, she came to Massachusetts to run her Great Uncle Arthur’s Book store. She is also the part owner of Mrs. Hudson’s Tea Room, located at 220 Baker Street. She wants to have the normal life of a modern young woman. Good friends, a successful business, even a love life. Unfortunately, being normal isn’t easy: she has a mind like the Great Detective himself. Gemma, how did you first meet Vicki? Vicki is a well-established mystery writer. 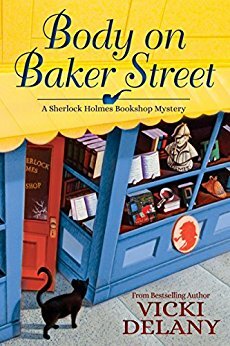 When she wanted to start a new series she hit on the idea of a Sherlock Holmes-themed bookshop. There isn’t much more popular in the world of popular culture today than the Great Detective, and it wasn’t hard to fill an entire store. By page two she realized that I have more in common with Sherlock Holmes than a deerstalker hat and a London accent. No, because if I did she might decide to kill me and make Great Uncle Arthur Doyle the protagonist of the series. Yikes! I wouldn’t want that. Tell us about your favorite scene in the book. I thought it was a good idea to break into the police station. They had the evidence I need to clear my friend Donald Morris of the murder of Renalta Van Markoff. A big classic rock concert in the park would keep all the cops busy, I know my way around the place, and I knew exactly where to look. I gathered all the necessary tools, called Jayne Wilson to act as lookout and then . . .
Did you have a hard time convincing Vicki to write any particular scenes for you? I’d prefer it if she didn’t point out all my faults. Too-clever-by-half she calls me. There’s a reason I haven’t told anyone the whole story of why Ryan Ashburton and I broke up, you know. And Vicki told the whole world. I tried to convince her not to write that scene, but she went ahead and did anyway. I love to swim in Nantucket Sound. Have a long swim, then relax in my beach chair with a good book I’ve grabbed from the shop. After that, I’ll take my dog, Violet, through the woods or along the seashore. The irony about living in a place so marvelous that hordes of tourists flock to it is that I myself don’t get much of a chance to enjoy it. I’d love nothing more than to grab Jayne, hop into the Miata, and take a couple of days to drive up Highway 6. To explore the historic lighthouses and open beaches of the National Seashore, poke around Truro and Provincetown, spend a night in a charming old B&B or a modern luxury hotel. Maybe make a day of it to take a whale watching excursion out of Brewster, explore the shops in Hyannis, and have a late lunch or early cocktails in Chatham. But summer in Massachusetts is short, and it’s the busiest time of the year, by far, at the bookshop, so I can rarely get away for more than a few hours. That’s an easy one. My best friend is Jayne Wilson. We’re business partners as well as friends. Sometimes that can be difficult but it works for us. She’s a baker, and runs Mrs. Hudson’s Tea Room at 220 Baker Street. The kitchen is not my natural domain. I own the bookshop at 222 Baker Street and Jayne doesn’t interfere with that. She’s hardworking, smart, intensely loyal, very beautiful. Her only flaw is that she has terrible taste in men. I’m determined to do something about that. Fear not, I’ll be subtle. Being lonely. I can’t not observe the things I observe or come to the conclusions I come to. Sometimes it makes people afraid of me. I ruined the marriage proposal of the man I love because I couldn’t help being too clever by half. As he called me. What’s the best trait Vicki has given you? I am highly observant, and I can analyze data in a fraction of the time it takes other people. What’s the worst? I am highly observant, and I can analyze data in a fraction of the time it takes other people. My life is pretty good. I love owning the shop. I love living with my Great Uncle Arthur, not that he’s around much. Which might be part of the reason we get on so well. I love living near the sea, and I’ve made a home and friends in West London. I just wish people would stop being murdered so near me. West London, Massachusetts is located on Cape Cod, quite near to Chatham. The Atlantic Ocean is on the east and Nantucket Sound to the south west. We have historic houses, a charming shopping district on Baker Street, fabulous restaurants. Please encourage all your readers to come for a visit. I’ll put the kettle on. It sounds wonderful. Will you encourage Vicki to write a sequel? She is hard at work on The Cat of the Baskervilles, which will be out in February 2018. 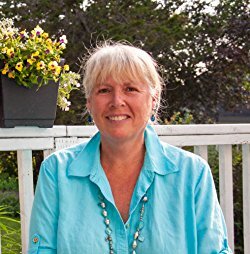 Vicki Delany is one of Canada’s most prolific and varied crime writers and a national bestseller in the U.S. She has written more than twenty-five books: clever cozies to Gothic thrillers to gritty police procedurals, to historical fiction and novellas for adult literacy. Under the name of Eva Gates, she writes the Lighthouse Library cozy series for Penguin Random House. Her latest novel is Body on Baker Street, the second in the Sherlock Holmes Bookshop series from Crooked Lane.